Enjoy convenient access to San Mateo Expo Center and San Francisco International Airport while staying at this business friendly San Mateo, California hotel. This property offers guests great customer service and quality amenities for an affordable price. While staying at this San Mateo hotel, guests will enjoy well-appointed guest rooms featuring cable satellite television and free high-speed Internet access. To ensure a great start to the day, this San Mateo hotel serves a complimentary continental breakfast every morning. Guests traveling on business will also appreciate the variety of business services including fax and photocopy services. Spend the day in nearby downtown San Francisco touring the sites or conducting business in the peninsula or nearby Silicon Valley. This San Francisco Airport Hotel's Near it AllHere in San Mateo, CA, our hotel's guests can easily get to all the attractions and businesses of the San Francisco Bay area. In addition, a free shuttle runs between San Francisco Airport (SFO) and the Holiday Inn® & Suites San Mateo - San Francisco SFO.This hotel is ideal for every corporate traveler. Use the 24-hour Business Center and free Wi-Fi access to keep in contact with the office anytime. Over 2,500 sq ft of meeting space is available in three rooms, so you can host your next event with us. Since we're near SFO, the hotel is moments from Tech, Pharmaceutical, and Corporate, too.There's a lot to do around San Mateo, CA, as the hotel's property is a stone's throw from Coyote Point Museum, home to almost 100 exotic animals. Families love spending a day at the Great America Theme Park in nearby Santa Clara. And, of course, San Francisco is chock-full of excitement and fun, from Fisherman's Wharf to AT&T Park and Union Square to the famous Golden Gate Bridge.You'll have the time of your life staying at this 100% nonsmoking, green lodging. After a long day on the town, why not sit back and relax in the whirlpool or sauna? The 24-hour Fitness Center makes keeping up your workout regimen a cinch. If you get hungry, head down to the Bistro 330 Bar & Grill, where there's sure to be something delicious for everyone. Book now and discover just how much fun the San Francisco area can be. Featured amenities include express check-out, complimentary newspapers in the lobby, and dry cleaning/laundry services. A roundtrip airport shuttle is complimentary (available on request). With a stay at Extended Stay America San Francisco - San Mateo - SFO in San Mateo, you'll be within a 10-minute drive of San Francisco Bay and San Mateo County Event Center. This hotel is 11.1 mi (17.9 km) from Facebook Campus and 16.1 mi (25.8 km) from Stanford University. 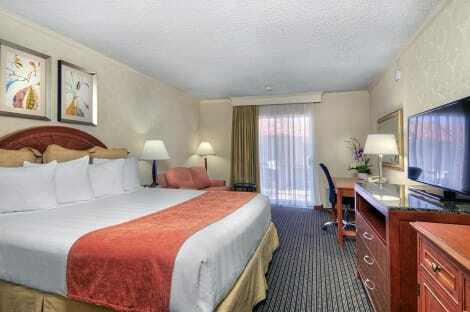 Make yourself at home in one of the 157 air-conditioned rooms featuring refrigerators and microwaves. Wired and wireless Internet access is complimentary, while 37-inch flat-screen televisions with satellite programming provide entertainment. Private bathrooms with shower/tub combinations feature complimentary toiletries and hair dryers. Conveniences include desks and coffee/tea makers, as well as phones with free local calls. With a stay at Residence Inn by Marriott San Francisco Airport/ San Mateo in San Mateo, you'll be a 5-minute drive from San Francisco Bay and 7 minutes from San Mateo County Event Center. 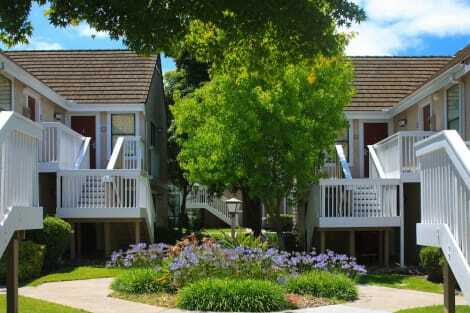 This hotel is 12 mi (19.4 km) from Facebook Campus and 17 mi (27.3 km) from Stanford University. When you stay at San Mateo Marriott San Francisco Airport in San Mateo, you'll be near the airport, within a 10-minute drive of San Francisco Bay and San Mateo County Event Center. 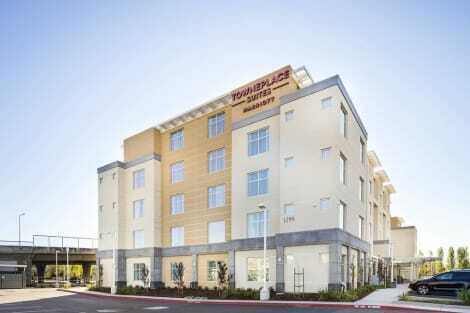 This 4-star hotel is 11.3 mi (18.2 km) from Facebook Campus and 16.2 mi (26.1 km) from Stanford University. lastminute.com has a fantastic range of hotels in San Mateo, with everything from cheap hotels to luxurious five star accommodation available. We like to live up to our last minute name so remember you can book any one of our excellent San Mateo hotels up until midnight and stay the same night.